Scourge of England and France, father of the Great Heathen Army and lover to the mythical queen Aslaug, the legend of Ragnar Lothbrok has enchanted story tellers and historians for almost a millennium. Immortalised in the Icelandic sagas of the thirteenth century, the semi-legendary Norse leader has since become familiar with modern audiences through the hit television show ‘Vikings’ – but there remain many doubts over his true existence. Ragnar himself stands on the farthest reaches of our past, in the dim grey that bridges myth and history. His story was told by the skalds of Iceland, 350 years after his supposed death, and many kings and leaders – from Guthrum to Cnut the Great – claim a lineage to this most elusive of heroes. So the legend goes, Ragnar – the son of King Sigurd Hring – had three wives, the third of whom was Aslaug, who bore him such sons as Ivar the Boneless, Bjorn Ironside and Sigurd Snake-in-the-Eye, and all three would grow greater in stature and fame than he. Indeed, in 865, Britain was subjected to the largest ever Viking invasion at the time – led by Ivar the Boneless, whose remains now lie in a mass grave in Repton – which would precipitate the beginning of Danelaw. Yet, how much of our history really owes its existence to this legendary Viking king who had such a profound and lasting effect on this country we call England? The evidence to suggest Ragnar ever lived is scarce, but, crucially, it does exist. Two references to a particularly eminent Viking raider in 840 AD appear in the generally reliable Anglo-Saxon Chronicle: ‘Ragnall’ and ‘Reginherus’. In the same way that Ivar the Boneless and Imár of Dublin are considered the same person, Ragnall and Reginherus are believed to be Ragnar Lothbrok. It is said this infamous Viking warlord raided the coasts of France and England and was duly given land and a monastery by Charles the Bald, before betraying the covenant and sailing up the Seine to besiege Paris. Having then been paid off with 7,000 livres of silver (an enormous sum at the time, roughly equivalent to two-and-a-half tonnes), Frankish chronicles duly recorded the death of Ragnar and his men in what was described as “an act of divine retribution”. This may well have been a case of Christian proselytism, as the Saxo Grammaticus contends Ragnar was not slain, but in fact went on to terrorise the shores of Ireland in 851, and began a settlement not far from Dublin. In those ensuing years, Ragnar would supposedly raid the breadth of Ireland, and the north-west coast of England. It would seem therefore that his death at the hands of Aella in a pit of snakes has its roots in myth rather than history, for it seems probable that Ragnar perished sometime between 852 and 856 during his travels along the Irish Sea. However, while Ragnar’s relationship with King Aella is likely fabricated, his relationship with his sons may not have been. Of his sons, significantly more evidence exists as to their authenticity – Ivar the Boneless, Halfdan Ragnarsson and Bjorn Ironside are all genuine figures in history. Intriguingly, though the Icelandic sagas that detail Ragnar’s life are oft considered inaccurate, many of his sons lived in the right places and times to match the deeds mentioned – and indeed his sons claimed to be the offspring of Ragnar himself. Could these Viking warriors really have been the sons of Ragnar Lothbrok, or were they claiming lineage to the legendary name in order to increase their own status? Perhaps a bit of both. It was not uncommon for Viking kings to ‘adopt’ sons of great standing to ensure their rule continued after they were departed, and so it stands to reason Ragnar Lothbrok may well have been associated with the likes of Ivar the Boneless, Bjorn Ironside and Sigurd Snake-in-the-Eye, one way or another. What isn’t in doubt is the lasting impact his supposed sons left on Britain. 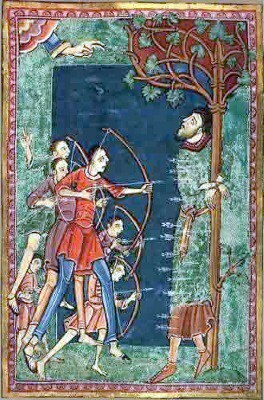 In 865, the Great Heathen Army landed in Anglia, where they killed Edmund the Martyr in Thetford, before moving northwards and besieging the city of York, where King Aella met his death. Following years of raids, this would mark the beginning of a nearly two-hundred-year period of Norse occupation in the east and north of England. In reality, it is likely that the fearsome Ragnar Lothbrok’s legend was indeed built upon the reputation of the Ragnar who successfully raided Britain, France and Ireland in the ninth century for extravagant quantities of treasure. Then, in the centuries that passed between his travels and the subsequent recording of them in thirteenth-century Iceland, Ragnar’s character absorbed the achievements and successes of other Viking heroes at the time. So much so, that the sagas of Ragnar Lothbrok became a conflation of so many tales and adventures, and the real Ragnar soon lost his place in history and was adopted wholeheartedly by the realm of mythology.